The Ion Cleanse Footbath purifies the body through the electrolysis of the water. Relax with your feet in water for about 10-30 minutes and visually see the results. The IonClenase by AMD’s proprietary and patented technology results in only bio-compatible electrical frequencies enter the water. This elicits a relaxation response. Concurrently, these frequencies create an ionic field that cleanses and purifies the body through the healing power of ions. The IonCleanse process ionizes the water which attract and neutralize toxins. The IonCleanse helps to eliminate heavy metals from the body which helps to reduce illness and inflammation. The cleaner the body is internally, the better other therapies and modalities will work including chiropractic, acupuncture, and massage. It has also been found to help the body reduce levels of glyphosate-an herbicide chemical used on crops we ingest. After a session our clients feel calmer and focused. There are no side-effects and the process is non-invasive. 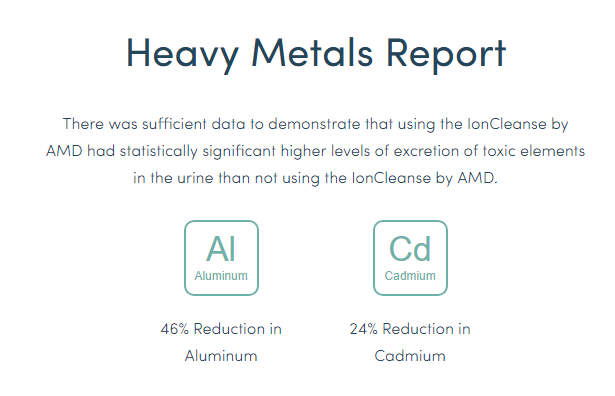 IonCleanse users have been shown to continue to excrete heavy metals from the body days after the treatment. IonCleanse by AMD detox footbath usage resulted in lower glyphosate levels in study participants as compared to the control group. You can visually see what your body is releasing!